London, September 12, 2008 – Grand Marnier can be enjoyed naked or dressed up this Christmas as the iconic orange and cognac brand launches its 2008 Limited Edition Bottle. ‘Cosiness’ is the theme as diva-like, the naked shoulders of a Grand Marnier bottle emerge from an opulent red fur collar and nubuck coat adorned with a vibrant metal label. The warm tactile materials cry out to be touched, while the aromas of orange and cognac demand it be tasted. The smooth and soft red coat is designed to be removed to reveal the elegant rounded bottle, so that Grand Marnier can be appreciated naked or dressed up. 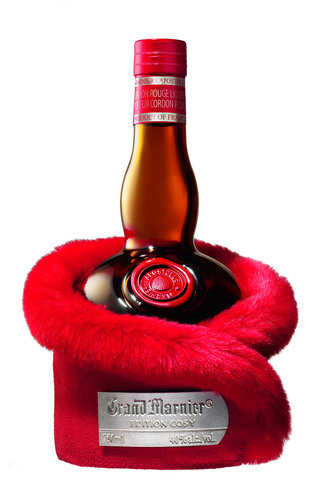 Luscious and orangey with a gorgeous aroma of cognac, Grand Marnier is traditionally associated with Christmas. The audacious special bottle is designed to create a new perception of the classic liqueur which can be drunk as a traditional digestif, on ice, or as a fabulous festive aperitif cocktail. To celebrate the festive season, Grand Marnier has created a new cocktail,entitled simply ‘Cosy’. Like the Cosy bottle it can be dressed up in party clothes. Pour grenadine syrup into a saucer. Place sugar in another saucer. Dip the rim of the champagne glass in the grenadine and then in the sugar. Warmth, conviviality and tender sharing moments are conveyed by the new Limited Edition Bottle, the sixth in the series. Over the years, the bottles have become eagerly sought after by collectors. Only one thousand of the new design will be available in the UK. The Grand Marnier Limited Edition bottle is always much in demand in top end hotel and style bars. The Cosy bottle will also be available from premium retailers priced at about £20 a bottle. This press release was distributed by ResponseSource Press Release Wire on behalf of Voice PR Ltd in the following categories: Men's Interest, Leisure & Hobbies, Home & Garden, Women's Interest & Beauty, Food & Drink, for more information visit https://pressreleasewire.responsesource.com/about.